Over 60 Ducks in the Cove! You are here: Home / Art Blog / Birds / Over 60 Ducks in the Cove! 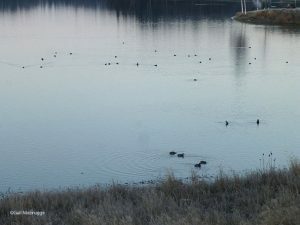 This morning I was surprised to see more than 60 ducks swimming in our cove, some came up onto the lawn but most stayed in the water feeding and preening. By noon they were all gone! I think we are being considered as a “hot spot” for the duck migration. I stopped putting out cracked corn two weeks ago, thinking that would stop their visits. It does keep most of them off the lawn, and we enjoy watching them swimming in the cove.